This part can be used to induce surfactin production (an antimicrobial lipopeptide) and to repress the biofilm formation in B. subtilis strains. The part was transformed into the B. subtilis 168 ΔabrB strain containing the mutated biofilm repressor gene (abrB). As a result, this strain forms biofilms. If the part is functional, the transformed strain should not form biofilms as AbrB will repress genes involved in biofilm formation. In fact, the transformed B. subtilis 168 ΔabrB strain with BBa_K802009 should be similar to the wild-type B. subtilis 168 strain as far as the biofilm formation is concerned. In order to test the biofilm formation of the transformed bacteria, a qualitative test was performed in a 24-well microplate. Saturated liquid cultures were used to inoculate 2 mL of LB medium (dilution ratio of the tested culture compared to the saturated culture : 1/100) supplemented with 2% xylose as abrB gene is under the control of the Pxyl promoter. The negative control was the B. subtilis 168 ΔabrB strain. The positive control was the wild-type B. subtilis 168 strain. As it can be seen in the video, the transformed strain does not form a sticky pellicular biofilm as opposed to the wild-type strain. The results show that the characteristics of the transformed mutated strain resemble more the B. subtilis 168 strain than the B. subtilis 168 ΔabrB strain. 4 is a negative control (supernatant from B. subtilis 168 strain transformed with the same plasmid which was used for cloning the part BBa_K802009, but without the part). Comparison between the cuvettes 3 and 4 shows that the emulsion is due to a surfactant present in the supernatant of the transformed bacteria with BBa_K802009. The absence of an emulsion in cuvette 4 confirms that the observed effect in due to the cloned sfp gene and not to the backbone vector. 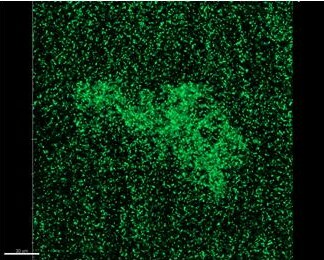 In order to test the efficiency of the part, the action of the transformed B. subtilis strain on the development of an E. coli biofilm was observed. The test was performed on glass slides in a 12-well plates. 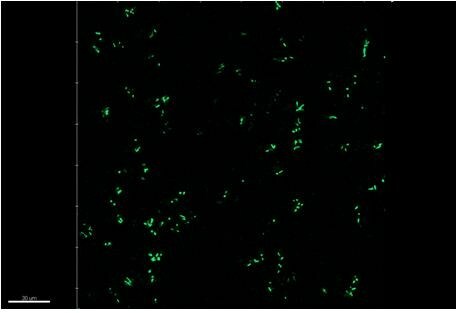 Wells containing a B. subtilis 24-hour biofilm were seeded with a fluorescent adherent E.coli strain and incubated at 30°C for 36 hours before observation. The negative control contains no B. subtilis biofilm. As it can be seen in the image above, the B. subtilis biofilm sticks to the surface and covers the glass. As a result, the E. coli biofilm cannot develop. The filtered supernatant from the transformed strain was incubated in wells containing glass slides for 24 hours. Then, the supernatant was replaced with LB medium diluted 2 times and seeded with a saturated fluorescent adherent E. coli strain. In order to compare the surfactin secreted by the strain containing the part and the purified molecule, the positive control wells were incubated with a solution containing surfactin at a concentration of 80 µg/mL. To make sure that the observed effect is not due to the antibiotic or to the backbone, control wells were incubated with the supernatant extracted from a saturated culture of B. subtilis transformed with the empty backbone. The plate was incubated at 30°C for 36 hours. The effect of the supernatant extracted from the B. subtilis strain transformed with BBa_K802009 on an E. coli biofilm. 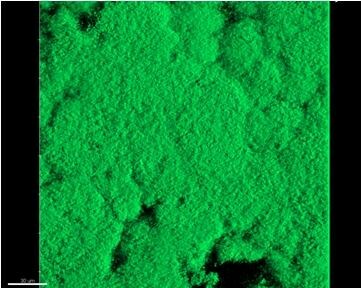 The surfactant properties of the supernatant containing the surfactin are effective in preventing biofilm formation. 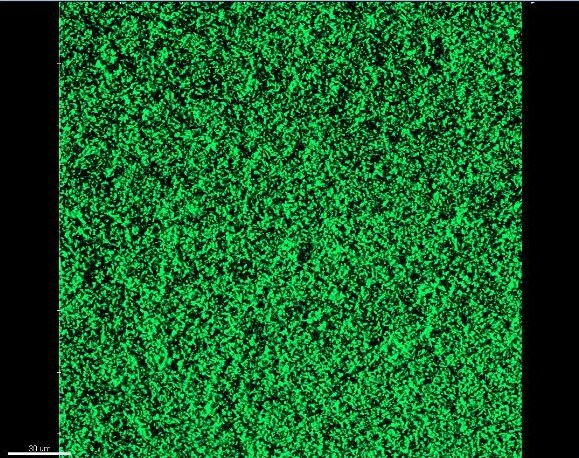 BBa_K802009 part was shown to be efficient in controlling the ON and OFF biofilm states in B. subtilis. Moreover the production of surfactin was efficient, so this part can be a source of surfactin that can be easily extracted from the supernatant of the cultures. This part can be used in B. subtilis for the control of biofilm formation and for the production of a surfactant that will prevent the growth of other bacteria.